Intertrader Direct is one if the best brokerage firms in the world, they are a well-managed brokerage firm that has its core business built around improving their clients’ market experience. Most brokerage firms in the world are known by their trading names, but few know their parent companies that really own the brokerage firm and its rights to control. To be transparent and improve their reliability, Intertrader Direct is simply the trading name for Intertrader Limited which is wholly owned by GVC Holding PLC which is one of the leading online gaming companies in the world. GVC Holdings PLC recently acquired one if the best known online gaming companies in the world; Bwin.Party and this led them to increase their capitalization to 1.4 billion Pounds. To add to their credibility, they are also listed on the London Stock Exchange which is a show of stability, and that is what every client wants to have from a brokerage firm. Their services are to tier, and this was vindicated by topping the client satisfaction rating for value for money from their spread betting and forex trading clients who were part of the Investment Trends survey for 2013 and 2015. With such accolades, it is not a surprise that they have been able to grow their client based at a formidable pace. As for their clients’ peace of mind, they are a registered brokerage firm in Gibraltar one the British-owned islands off the coast of Spain. They are authorized and regulated by the Gibraltar Financial Services Commission, and because of Gibraltar’s links to Britain Intertrader is also registered with the Financial Conduct Authority with the reference number 597312. Also, their clients’ funds are covered by the Gibraltar Investor Compensation Scheme if Intertrader lands into financial woes and apart from that they have segregated accounts for their clients and their company funds to avoid client’s funds being used in settling any company expenses. As any other brokerage firm, they have a unique characteristic that sets them apart from the rest if their competitors. Intertrader has some unique characteristics that really set them apart from the rest, and that is why more and more clients keep flowing into their firm. They offer low-cost trading for their clients which is one of the things that every client needs from their broker. Apart from the low cost they are a market neutral brokerage firm, this means they are totally a client based firm in that they do not take positions against their clients rather they forward all their orders straight to the liquidity providers. They also know that a motivated trader is poised to trade much more and more effectively and that is why Intertrader Direct has created the TradeBack volume rebate program that allows the traders to get back volume rebates from their trading activities. All their clients both the small account holders and the big account holders have access to high liquidity which means all of them have a chance to perform at their best given the conditions of the market at any given moment. They have one of the easiest sign-up processes in the industry; it is an easy three step process that involves identification for verification purposes, funding the account and lastly the client can start trading, and that is all that is required. 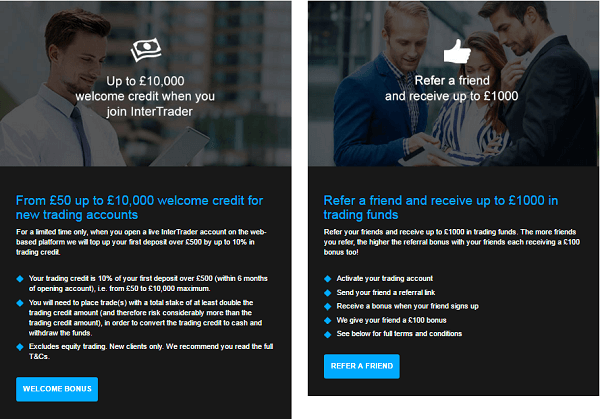 In order the traders can be encouraged to invite and also to trade some more they are given a trading credit that is only available for traders who deposit 500 Pounds to their account, they are rewarded with 10% credit of the balance but this is only made available for clients with balances of up to 10,000 Pounds. Another offer, that one gets is for referring a friend; the trader gets up to 1,000 Pounds as the friend gets up to 100 Pounds as a bonus for joining, there I more information on this on their website. Trading platforms are at the core of any brokerage firm and the better your trading platform, the more you are going to get from your clients’. That is one of the things that many traders wish for; they need a broker that will give them the tools they need to take their trading to that other level. Intertrader Direct has three very powerful trading platforms, and they have them in all their variations; they have the web-based platform, which is their own proprietary trading platform, this platform is so strong, and it has some characteristics that set it apart from other web based platforms. It is fast, reliable and easy to use; it is a No Dealing Desk trading platform, and it offers a 100% market neutral type of execution. It has no requotes, no platform fees and this may seem like hype, but it also offers price improvements or positive slippage that is how good the platform is. 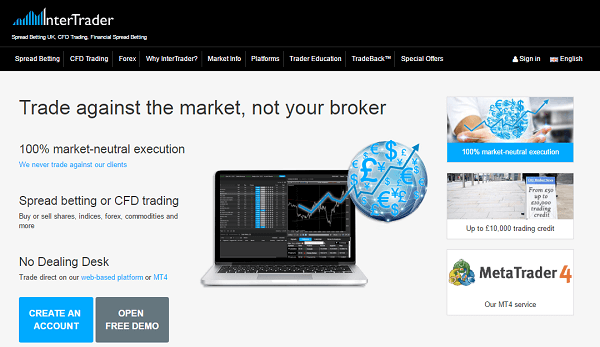 The another trading platform that is widely known is the MT4 trading platform, and with this platform, you can automate your trading strategies and create an expert advisor that will run your trading on your behalf. 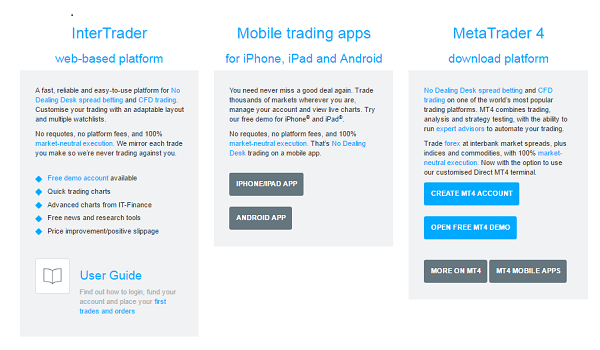 The another trading platform is the mobile trading platform that is available on iPhone, iPad, and Android devices. Every trader knows that their education is their lifeline, so it is important to have a solid educational base when it comes to trading education. That is why Intertrader Direct has free webinars for their clients; these are scheduled, and the timetable in which they are run is shared on their website. They also have the Smart Trader blog that shares articles and information about the markets in general. The other means in which they share their information is through the video tutorials they post on their site on different trading practices and information.